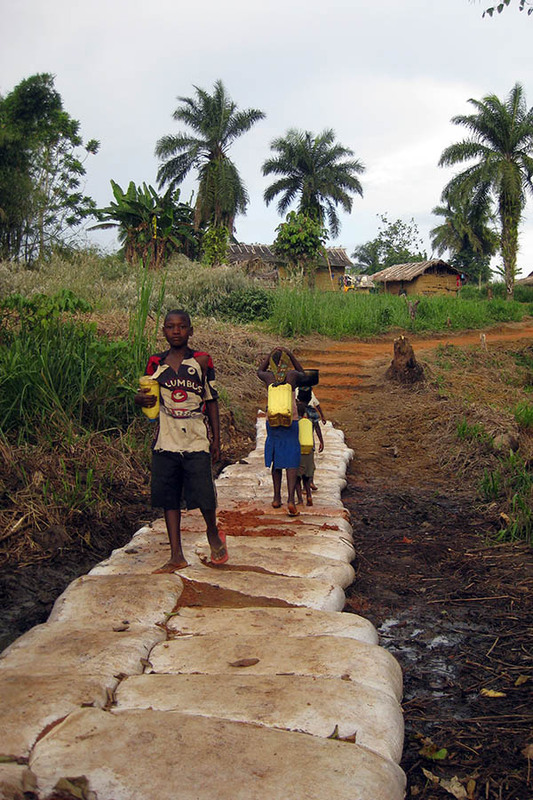 Water is generally considered the most important thing for human survival, so it makes sense that water plays a central part in humanitarian work. 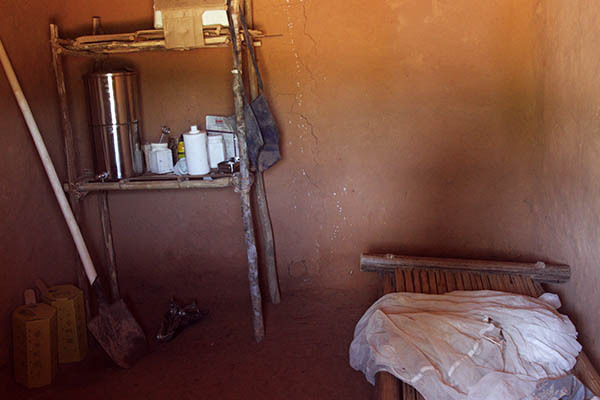 Humanitarian agencies need water for their staff and their projects, and the people they try to help need water to survive and maintain their health. 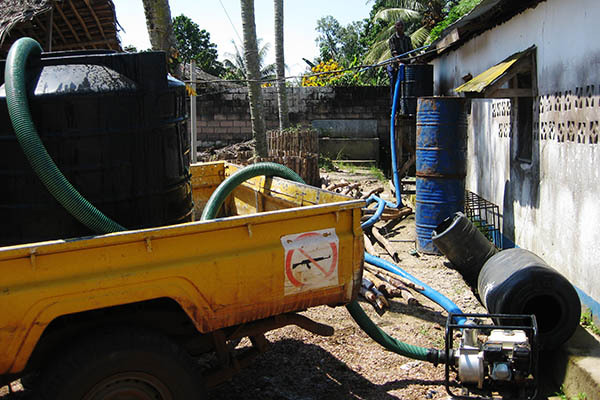 Medical organisations and local hospitals and health clinics need large amounts of water to maintain a sanitary working environment. Another form of water storage is a water bladder. This is basically just a big bag, which can be transported on a flatbed truck from the filling point to the distribution point. They can be punctured, which means they need to be carefully placed. This bladder at the MSF-Belgium hospital in Lubutu, DRC is hooked up to a hose with a valve. 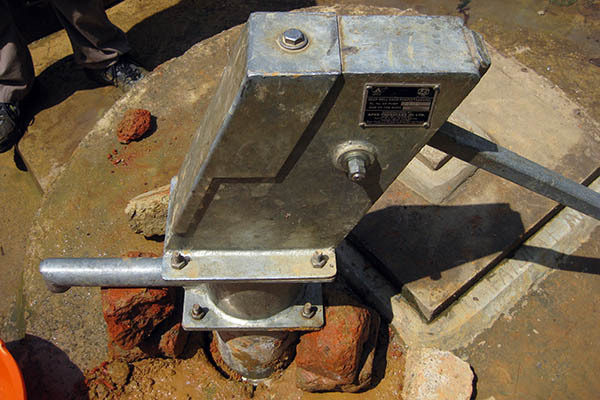 The bladder is on a raised platform in order to use gravity to pump the water through the hose when needed. 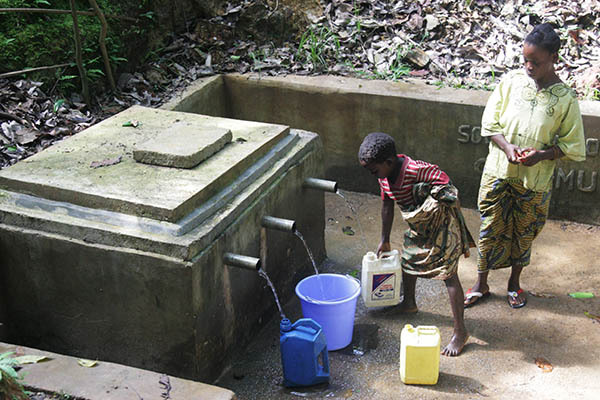 On a much smaller scale, water can be filtered and stored in filters like the one in the photo below. Water (preferably boiled and cooled) is put into the top half and the lid is put back on. There are ‘candles’ made of some sort of porous material in the top half, and in order for the water to get to the bottom half, it has to pass through these candles. The porous material filters out all the bad stuff, and drinking water comes out the little tap at the bottom. These filters can have from one up to five candle filters in them, and each candle can filter about one litre of water per hour. So the larger models with five candles can produce about five litres per hour. We usually use these for expat staff houses as well. Water has to come from somewhere. 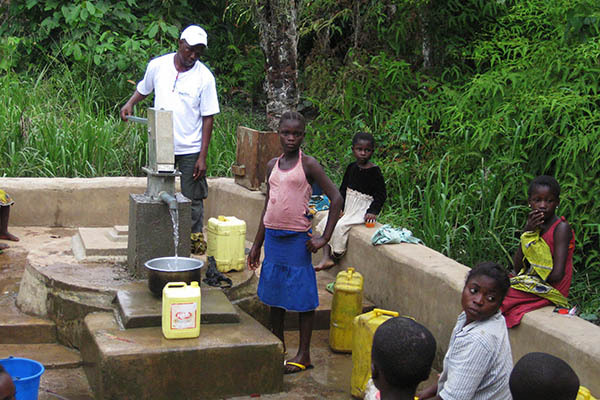 Natural springs, groundwater, and wells are common sources of water for humanitarian projects. Rainwater can also be a source of water depending on the location and season. While people often use surface water such as lake water and river water for their needs, this has a much higher likelihood of causing health problems because of the low quality of surface water. 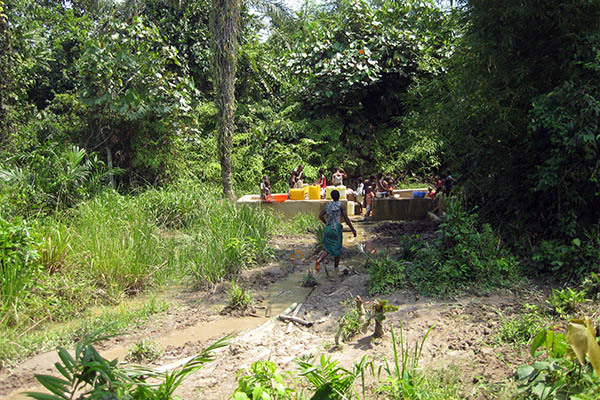 This is a natural groundwater source that was rehabilitated by Merlin (Medical Emergency Relief International) in a community called Pu Muzika in Obokote, DRC. The water source was already being used, but Merlin dug up the soil and created a natural filter using various sizes of gravel and sand, then covered it over again. 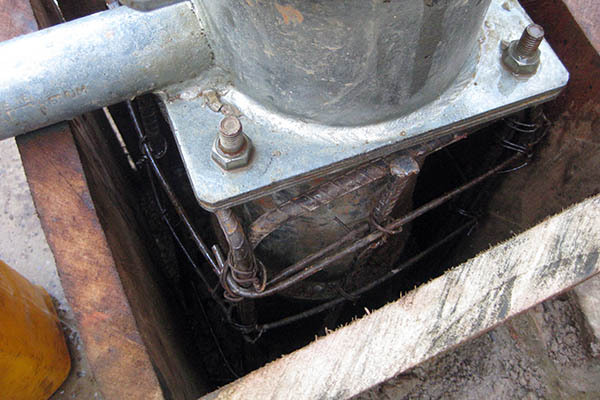 They also created this concrete enclosure with a concrete storage tank and water pipes. 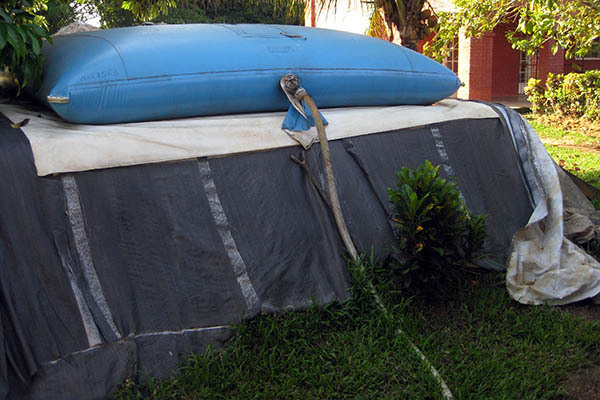 The slab of concrete on top of the tank can be removed in order to insert chlorine to treat the water. This is done every few months, and the water that comes out of the three pipes is as good as anything that comes out of a Canadian tap. We were informed of the problem, and immediately went to the site to assess the damage and make an action plan to fix it. In addition to the pump issue, we found that we could barely get to the pump without falling into the mud. I barely managed with a few long leaps, but there’s no way it could be done with a 20kg jerrycan of water. The community members coming to get water were wading through mud that could go up nearly to their knees! They reported health problems associated with this, including ticks. We decided that, in addition to fixing the pump itself, we needed to make the water source more accessible to the community. To fix the pump problem, our rehabilitation officer made a rebar (the iron used to reinforce cement) cage and placed it around the pump, then put a wooden box around that. 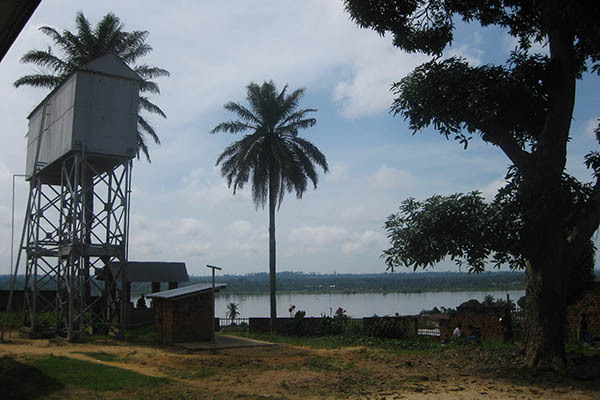 The wood held the pump at the correct height, and on a chosen day when the community knew the water would be temporarily unavailable, cement was poured into the wooden box. The ratio of cement powder to sand was much higher in this mix than usual, to create a really solid block. Mike, the project coordinator, told the rehabilitation officer that within 5 days he wanted to return to the site and walk all the way to the pump without getting his shoes wet. In order to make this possible, truckloads of laterite soil were transported from another community, and daily workers filled sacks with the soil and placed them in a row where they had cleared the brush. 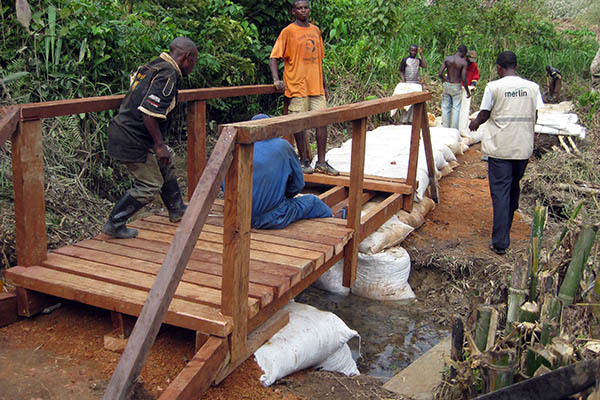 To deal with a small stream that was contributing to the mud swamp, a very strong bridge was built (there’s no point trying to stop water, as water will almost always win a fight against humans; it’s much better to find ways to get around/over it than to try to stop/divert it). 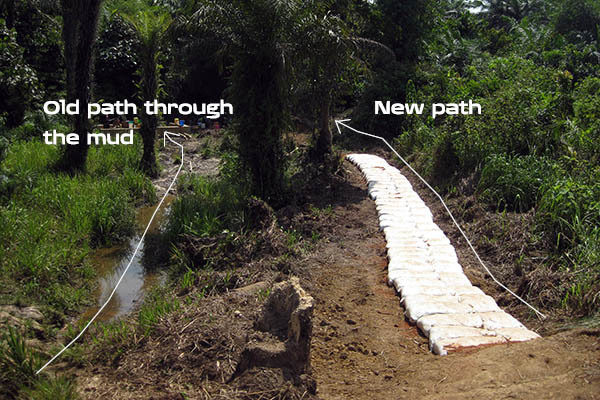 Once the sacks of laterite have all been filled and placed, loose laterite will be placed on top so the sacks won’t be visible anymore, and the path won’t be slippery even in wet weather. This entry was posted in Africa, Democratic Republic of Congo, Humanitarian and tagged Logistics, Lubutu, Maniema, Merlin, Obokote, Water. Chris! the last four posts have been so cool (slash informative). The photos are great, and such a good idea!